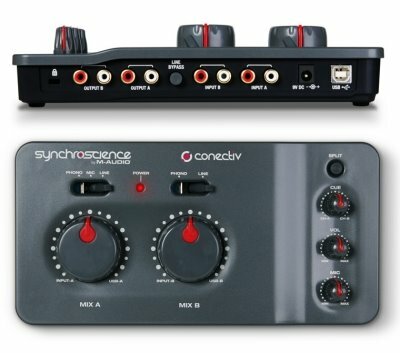 Conectiv, developed by M-Audio’s SynchroScience division, is the world’s first bus-powered 4 x 4 USB audio interface designed for DJs who perform and produce tracks with a laptop. Together, Conectiv and the included Torq software form the ultimate DJ tool—high-fidelity audio, all the right kinds of I/O (including dual phono preamps), and the ability to mix, beat-match and cue digital files with ease. Use them as a completely digital solution and leave the heavy stacks of vinyl or bulky wallets of CDs at home—or process your vinyl and CDs on the fly. You can even create a hybrid digital/vinyl DJ rig by using Conectiv and Torq with specially encoded control vinyl discs or CDs. Torq supports popular formats such as MP3, WAV, WMA and AAC files and is configured to automatically work with Conectiv—no messy set-ups. And unlike most digital DJ systems, Conectiv works with other third-party software as well.